The Milkweed plant is the sole host plant for Monarch butterflies. Although Monarchs have preferences of some varieties over others, there are many different species of milkweed plants that Monarch caterpillars will gladly gobble up. 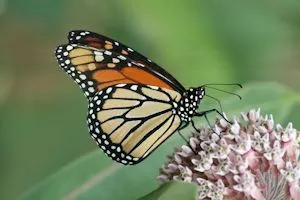 This article will present some of the best milkweeds for Monarchs, native ranges, and general information for several species. One great thing about Milkweeds is that they double as a host AND nectar plant. As a host plant, they are only used by Monarch and Queen butterflies but as a nectar plant they are quite popular among many butterfly species. Defining the “best” requires a combination of region, butterfly preference and plant performance. Different milkweed plants will grow better in various regions of the country while the butterflies “favorite” can also vary among regions (and even in the same garden from year to year). There are over 100 species of milkweeds in North America and not all of them are used by Monarchs. I will focus mainly on well-known plants that have seed available, are known to be used by Monarchs and are garden friendly (with a few exceptions that I will point out in the descriptions below). This list is not definitive and I encourage you to try a few varieties in your garden to establish what grows well and to give your Monarchs a choice as well as back-ups. 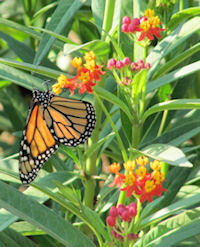 Many butterfly garden hobbyists have three or more different types of milkweed every year. This list is a combination from experience, forum comments, and research. I welcome your own experience so I can continually refine and expand this list by preference, region, and performance. Please Contact us if you would like to share your experience. Tropical milkweed probably wins the contest for the Monarchs favorite milkweed in most gardens. It is actually not native to the US but has naturalized in zones 9-11 (possibly 8b as well) where it grows as a perennial. However, this plant grows fast and easy from seed and readily flowers all summer so is used as an annual all over the US and Canada. It does not require cold stratification like many milkweed seeds do and it produces a lot of collectible seeds each summer. The seeds can then be winter sown or started indoors early in the spring to get a jump start on the butterfly season. This milkweed plant may reseed itself in your garden or may even return in the spring in a protected area. It is highly recommended by many butterfly gardeners and is also a great nectar plant for many other butterflies. For more detailed information, photos, and/or purchases please see our complete description at Tropical Milkweed (Asclepias curassavica). Swamp milkweed and the next few listed below are known to be high up in the Monarchs preference list. Due to native ranges, regions and individual garden variances it is difficult to put one over another as an overall Monarch “favorite”. Asclepias incarnata is a perennial, hardy in zones 3-8 (some reports include zone 9). It is a wetland plant but will do fine in medium moist conditions once established. It grows easily from seed if it is cold stratified before starting indoors or Fall/Winter sowed. This milkweed is native to most of the USA and eastern Canada with the exception being the west coast. 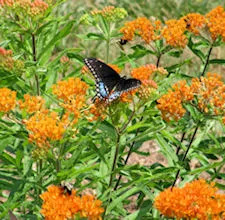 It is a nice addition to a butterfly garden and is also attractive to many species of butterflies as a nectar plant. Swamp milkweed is not invasive as some other milkweeds are and is well behaved in the garden. We have photos, more detailed information, and seeds/plants for sale at Swamp Milkweed. 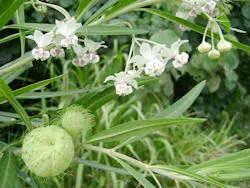 Asclepias physocarpa (also known as Gomphocarpus physocarpus) has many common names including Swan plant, Balloon plant, Oscar, Family Jewels, Hairy Balls and Giant Swan Milkweed. It is popular with the Monarchs and is a very interesting milkweed in that the seed pods are round balls. The flowers are pretty but not outstanding; however, the seed pods make this milkweed plant stand out as a conversation piece! The pods are also wonderful for dried arrangements. Family Jewels milkweed is actually native to South Africa. It is a tender perennial in zones 9-10 and in tropical areas could become weedy/invasive. It is grown as an annual in the cooler zones. Seeds can be collected in the fall and replanted in the spring. 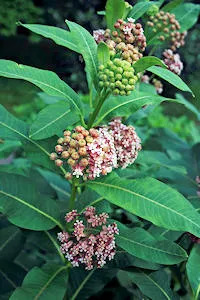 This milkweed is a large plant reaching 5-6 feet tall with a tree like form. To see more pictures, get more information or purchase plants/seeds please visit Asclepias physocarpa. There are two different species of milkweed that have the common name of “Purple Milkweed”; Asclepias purpurascens and Asclepias cordifolia. Asclepias cordifolia also has the common name of Heart-leaf milkweed. Heart-leaf milkweed is native to California, Nevada, and Oregon while Asclepias purpurascens is native to central and eastern US and Eastern Canada. 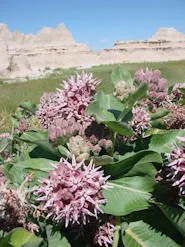 Both of these plants are sometimes favored among butterfly gardeners because they are unique in coloring with darker flower colors of violet or purple compared to most other milkweeds. They are also well behaved in garden settings and are easily controlled. Asclepias purpurascens is similar to common milkweed (discussed below) but its flowers are much darker and it is much better behaved in the garden. The hardiness range for Heart-leaf milkweed is zones 7-10 while Asclepias purpurascens is hardy in zones 3-8. Common Milkweed is a perennial that is native to North America. This milkweed and the one described below populate “weedy” areas within their region. They are attractive to Monarchs, although, the Monarchs may be more attracted to some of the milkweeds named above if they are available. Asclepias syriaca is native to the central and eastern half of the United States and Canada and is hardy in zones 4-9. It is easy to grow and does well in many different soil types. 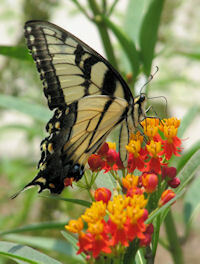 Asclepias syriaca will be a good choice if you have the space for it outside of your garden. In a fertile garden without the competition of weeds it is invasive. Common milkweed will sprout up everywhere through underground rhizomes (and reseeding) and is hard to eradicate. If you are looking for a milkweed plant to place in an ornamental garden you may want to consider a different type of milkweed (like the ones mentioned above) or keep your Common milkweed in large containers. Please visit our description of Common milkweed for more growing information and seed or plants. Showy milkweed is the western version of Common milkweed. It is found in the western half of the US and up into Canada. It is hardy in zones 4-9 and is a rhizomatous plant spreading underground or by seeds much like Common milkweed. As with Common milkweed, Showy milkweed can become very invasive in the garden. Showy milkweed earns its name when it is in flower. The flowers are fragrant and quite pretty set against silvery-green foliage. Asclepias speciosa will do well in dry conditions and poor soil. It is reported that this plant does not do well in containers unless they are 5 gallons or larger. 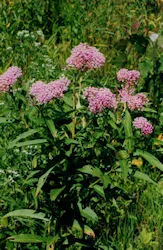 We have a description of Asclepias speciosa that provides much more information on growing and caring for Showy milkweed as well as seeds/plants for sale. Butterfly weed falls at the bottom of the list because most Monarchs prefer other milkweed plants. However, the Monarch butterflies have used it in my yard when it has been the first one up or when all other milkweed has been depleted. It is a big magnet for other butterflies as a nectar source. I really like this plant in my butterfly garden because it attracts many butterflies to its nectar and it is my backup caterpillar food. Asclepias tuberosa is a long lived and tough perennial and is hardy in zones 3-9. It is native to most of the USA and eastern Canada. It is an easy and dependable plant once it is established and it is very well behaved in the garden. Asclepias tuberosa produces a strong taproot which makes established plants difficult to transplant but also makes the plant tolerant of dry conditions. The Butterfly weed flowers have a bright garden presence and this is an easy milkweed I like having around. For more info, pictures, seeds and plants, please visit Butterfly Weed. There are many more types of milkweeds than I can cover here. If you have a local native-plants nursery you may want to check there for good native milkweeds in your area. Just be sure to ask about invasiveness if that is an issue for where you will be planting it. Also, I will add more milkweed plants to this list as I learn more from reader feedback or from research. One thing you should know about every milkweed plant is that it is poisonous to animals if consumed so you would not want to plant milkweed around livestock or a pet that likes to chew plants. 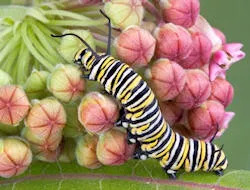 The toxicity of the plant is what helps protect the Monarchs from predators as they do not like the taste of the caterpillars or butterflies. Milkweeds get the “milk” in their name from the milky latex that oozes out when a leaf or stem is broken. This “milk” can cause severe eye problems if it gets in an eye. My kids and I have never had a problem with it but we are pretty strict about washing our hands after handling. Please be sure to take appropriate precautions when handling. One more thing, plant as many plants as you have room for. The Monarchs are very good at finding a milkweed plant but the more you have in your yard, the more likely they will find it and lay their little eggs all over it! I hope you really enjoy raising Monarch butterflies. 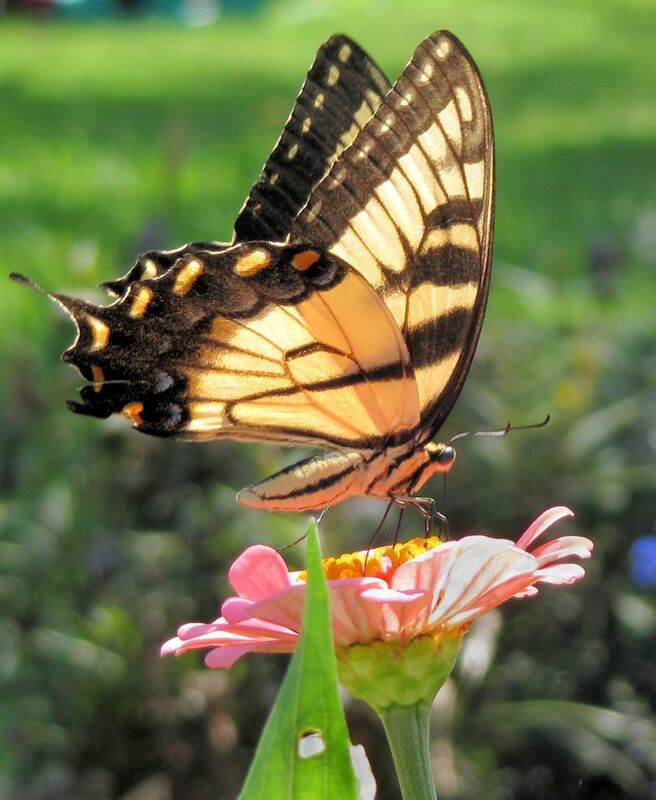 They are one of the butterfly species that is beautiful in all stages of their butterfly life cycle! 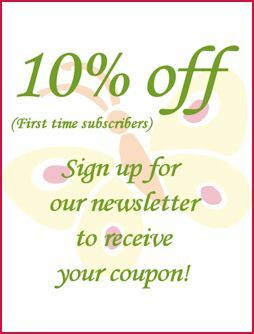 This entry was posted in Butterfly Seeds & Plants and tagged milkweed, monarchs.